I took a few photos of the well-known asterism, The Summer Triangle, on a recent very clear October evening, with my iPhone 7 camera. 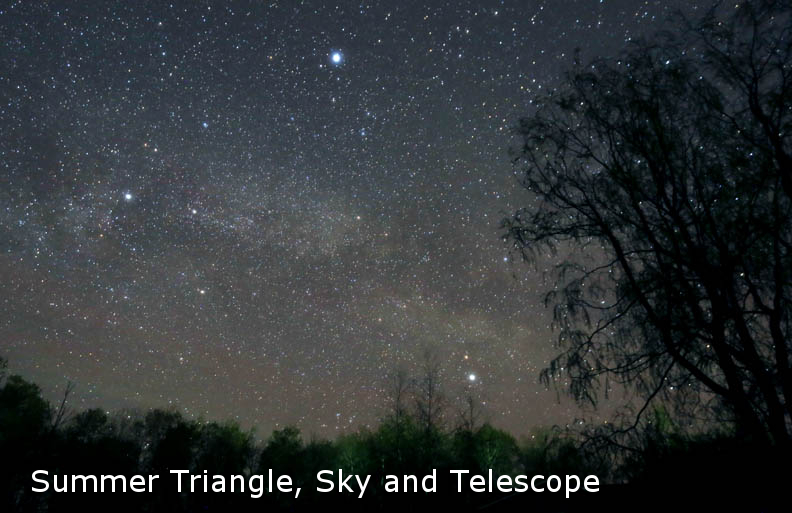 The Summer Triangle is easy to make out, once you are familiar with it and have a rough idea of where to look – it really does form a nice triangle of bright stars in the southern sky (as seen in the Northern Hemisphere), very prominent in the evening sky in the summer. The Big Dipper (in the constellation Ursa Major). The Northern Cross (in the constellation Cygnus). The Tea Pot or Tea Kettle (in the constellation Sagittarius). A constellation, on the other hand, is an officially designated “piece of the sky”, as recognized by the International Astronomical Association. It has definite boundaries, and any astronomical body can be associated with a particular constellation. So, it is said, for example, that a star or nebula is “in” a particular constellation (e.g. 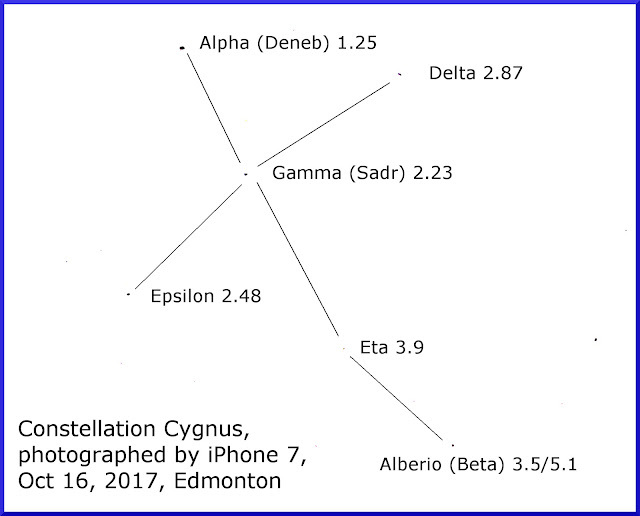 Deneb is in Cygnus), if it is in the part of the sky that is assigned that constellation name. · That can be confusing, as there are cases where an asterism has the same name as a constellation. For example, Leo is informally an asterism of a handful of stars that look somewhat like a lion, but it is also the name of a constellation that includes those stars, and a whole lot more. · Also, twelve of the constellations are also signs of the zodiac, which are familiar to people from reading horoscopes in the newspaper. I should note that astronomy and astrology are entirely different matters, though they do share some history and content. Cygnus the Swan - 2017 iPhone 7 photo. So Cygnus is a constellation, which is connected to the asterism The Summer Triangle, as they share the very bright star Deneb. 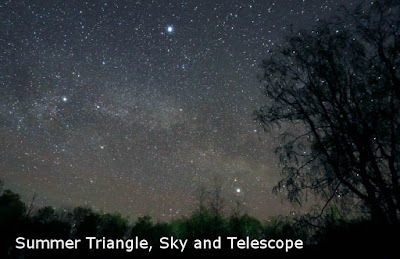 Within Cygnus is another asterism, known as The Northern Cross or The Swan. Here’s the iPhone image of Cygnus, with a little labelling and photo enhancement in GIMP. I also drew in the imaginary lines that make up the Swan or the Northern Cross, You can imagine The Swan, with its long neck, flying down the picture, through The Summer Triangle. Alternatively, you can imagine a cross, known as The Northern Cross - whether or not to give it a religious connotation is up to you. By the way, there is also a Southern Cross, but you have to go pretty far south to see it (it is featured on the Australian flag). 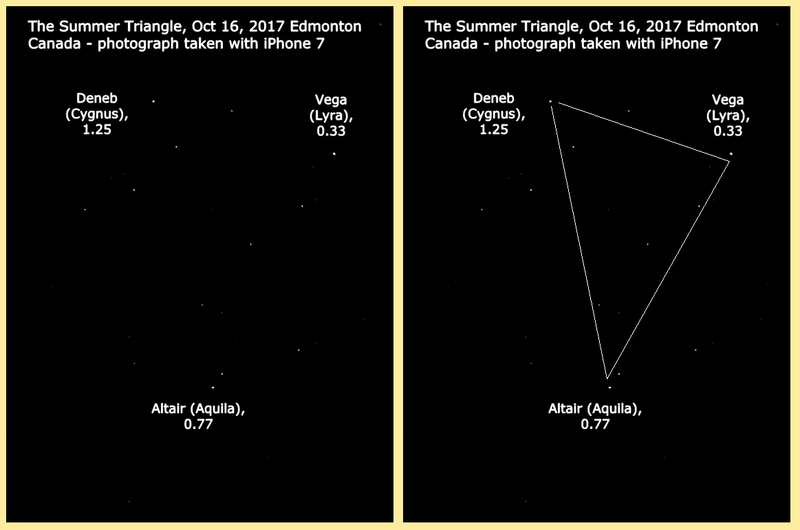 I also included a screen capture from the astronomy program Stellarium, to show how Cygnus relates to the Summer Triangle. As you can see, the iPhone picked up most of the major stars of The Swan. Eta seems to be somewhat out of place – it is possible that is not actually Eta – it could be a “hot pixel” that happens to be about the right brightness and position to be mistaken for Eta. Here’s another picture, with and without the lines connecting the stars of the Swan. Here’s an inverted image (black and white interchanged). Sometimes that format can be easier to decipher. There are multiple occurrences of swans in Greek mythology (the source of most star lore in the western world). The most famous is probably the subject of Yeats’ famous poem “Leda and the Swan”. Short story – the god Zeus pretends to be a swan, who impregnates the Spartan Queen Leda, which results in the birth of the beautiful Helen, who is later kidnapped, which leads to the Trojan War. It is not clear whether the constellation is actually connected with this story, but it is a difficult story to ignore (many constellations are definitely connected to Greek myths, though). Gamma Cygni is a yellow super giant, also very distant at about 1500 light years. It is also known as Sadr, which is Arabic for breast – i.e. the breast of the Swan. Delta and Eplison make up the wings of the Swan. They are both fairly close to Earth, about 170 and 70 light years, respectively. Alberio or Beta Cigni is a beautiful binary star, with amazing colours (see below). It is easy to see in a small to mid-sized telescope, and always a pleasing sight, with contrasting colours for the two stars, orange and blue-green. It is a great object for newcomers to telescopes, as it is easy to find and impressively beautiful. That system is about 380 light years from Earth. Cygnus X-1 is a very notable X-ray source, one of the brightest such sources in the sky. It is the first object to be considered a black hole. There are scads of exoplanets in Cygnus, as the Kepler orbiting telescope focused much of its time on that constellation, during its search for extra-solar planets. Generally speaking, it is a region of rich star fields, as one is looking towards the center of the galaxy when looking in the direction of Cygnus. Thus, there are many open star clusters and nebulae in Cygnus. It is easy to take pictures with an iPhone. That means it is quick and you don’t have to freeze in the cold, especially in my part of the world. It is fascinating to see just what a “simple” camera like an iPhone (or iPad) can do, these days, especially with a bit of post processing of the images. The iPhone sees pretty much what the human eye sees in the light polluted city, so it works well as an educational tool. Long exposure astrophotography is great, but the images don’t look much like the actual sky does, for a typical viewer. So, it is a nice tool for introducing people to the brightest stars in the sky. And, given how ignorant most modern people are of the sky, that seems like a good thing to do. It is good practice with Gimp or Photoshop. It makes for a relatively easy blog, and that is a lead-in to selling books, as you can see below. Though, as any blogger will tell you, the conversion rate from blog reader to book purchaser is exceedingly low. Nonetheless, we live in hope.